Water, Vinegar, Sugar, Salt, contains less than 2% of Soybean Oil, Canola Oil, Garlic*, Red Bell Peppers*, Citric Acid, Garlic, Onions*, Xanthan Gum, Propylene Glycol Alginate, Modified Food Starch, Spice, Potassium Sorbate and Calcium Disodium EDTA (to Protect Freshness).*Dried. 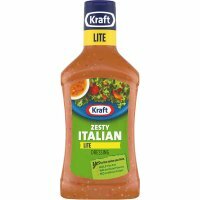 Light zesty Italian reduced fat dressing. Hidden Valley Light Dressing.40% fewer calories & 50% less fat than our regular ranch dressing.The Original Ranch.Betcha can't tell it's light! Get happy inside. American Heart Association: Diets low in saturated fat and cholesterol may reduce the risk of heart disease. Exchange: 1 carbohydrate. Perdue Perfect Portions all natural boneless skinless fresh chicken breast containing up to 10% of solution. 99 % fat free. No antibiotics ever. All vegetarian diet. no animal by-products. cage free. 5 individually wrapped easy open pouches. cooks in 10 minutes. 99% fat-free, boneless skinless chicken breasts portions cooks quickly and evenly and are easy to store and prepare. Individually wrapped to seal in the freshness and flavor, use the portions your need now and save the rest. Ready in minutes, PERDUE PERFECT PORTIONS Boneless Breasts are a convenient, time-saving alternative for any meal. Store the remaining portions in their resealable bag in your refrigerator or freezer - it's that easy. The Perfect Solution for Your Next Meal. fairlife 2% reduced fat ultra-filtered milk has 50% more protein and 50% less sugar than regular milk while still being incredibly delicious and satisfying. Canada Dry Tonic Water.Since 1904.Contains quinine.